I am trying to share a folder with many Numbers files with iCloud, by sharing each file with an AppleScript and saving the path of each shared file so that I can send it to my collaborators. To do that, I use System Events. I got to the point in which I can share the files, but I cannot do something really simple. By default, when you share a file Numbers gives you the "Mail" option by default in the "Invite with..." . There is also an option "Copy link". If I find a way to select that option, I can get then everything else working. However, despite my many attempts, I could find no way to tell System Events to change that default selection. Yet I can see what syntax Automator uses for the very same action, but when I copy that syntax into Script Editor, the action is not executed. tell menu bar item "Share"
click menu item "Share Link via iCloud…"
click button "Share Spreadsheet" of UI element 1 of sheet 1 of window "test"
tell menu bar item "Numbers"
click menu item "Quit Numbers"
However, I found no way to do the simple extra step of changing the default value of mailing the link (you will see that the script paste the link into a message. Does anybody have any clue as to how to achieve that? I tried the following possibilities, from a call to "System Events": --click image 1 of UI element 3 of row 1 of scroll area 1 of UI element 1 of sheet 1 of window "test" of application process "Numbers" --click button "Copy link" of row 1 of scroll area 1 of UI element 1 of sheet 1 of window "test" of application process "Numbers" --click UI element 3 of row 1 of scroll area 1 of UI element 1 of sheet 1 of window "test" of application process "Numbers"
OK so I answer my own question. It is possible to do what I wanted, although I did not find a satisfactory solution. The long answer is: it is a pain in the neck for a series of reasons. First, when you create a Numbers file, it is a simple file. However, when it is shared, or when it is being saved in iCloud, it becomes a package. Applescript sees packages as folders, so you have to do some check before doing anything as to whether what you are dealing with is a folder or a package. 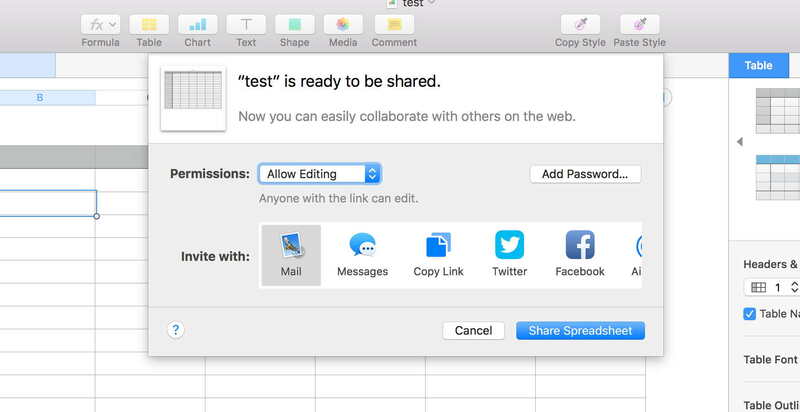 Then you can go on to the sharing operations. Third, you have to take care of the .DS_Store files and other files that may be inside the folder where you put your Numbers documents to be shared. Fourth, if you want to identify where the iCloud folder with the documents to be shared is, from inside AppleScript you won't see it as you see it from the finder (i.e., in the iCloud Drive), but you will have to look for it in /yourUser/Library/Mobile Documents/iCloud Drive/yourfolder. you have a file where you want to save the paths of the files that will be shared, so that you know the paths that you have to communicate to those with who you want to share your files. In my case, I use a Pages document. the files to be shared ARE NOT already shared. Otherwise, the script will give errors. you don't care about errors and style. The script has no error checks. I am not a programmer. The script will ask you to first identify the folder with the documents to be shared, then the Pages file where you want to save the paths of the shared documents, and then will open the documents to be shared one by one, will share them, will save them, will copy their path to the Pages document that you selected, and finally will quit Numbers and Pages. Give plenty of time for the script to execute and don't interfere with it. Notice that when you open each Numbers file, you can modify the script so that you insert specific operations that you want to be done on your files, always with the same technique (for example, in my case I need to find a cell, find a value, copy it somewhere else and save it. This part of the procedure is not in the script below. You can add whatever your fantasy leads you to invent as contorted and complicated operations). I paste the script below. -- leave some time for Numbers to actually share the file. Maybe you need more time for your system. Not the answer you're looking for? Browse other questions tagged macos icloud applescript automator .